These verses are peculiar to the Gospel of Luke. It is plain from verse 9 that these words were addressed, not to His disciples, but to the self-righteous, including the Pharisees. "Confident of their own" is reflexive, not reciprocal. This is important. Self-righteous people do not trust each other for righteousness, but only themselves (no one else). The self-righteous person declares himself righteous. This is the most awful delusion under which a person can live, but that person does not see it and we see it all around us (and in us). "Everybody else" is all-inclusive. That includes other Pharisees. Self-righteousness causes a person to think that they alone are righteous, to the exclusion of all others. 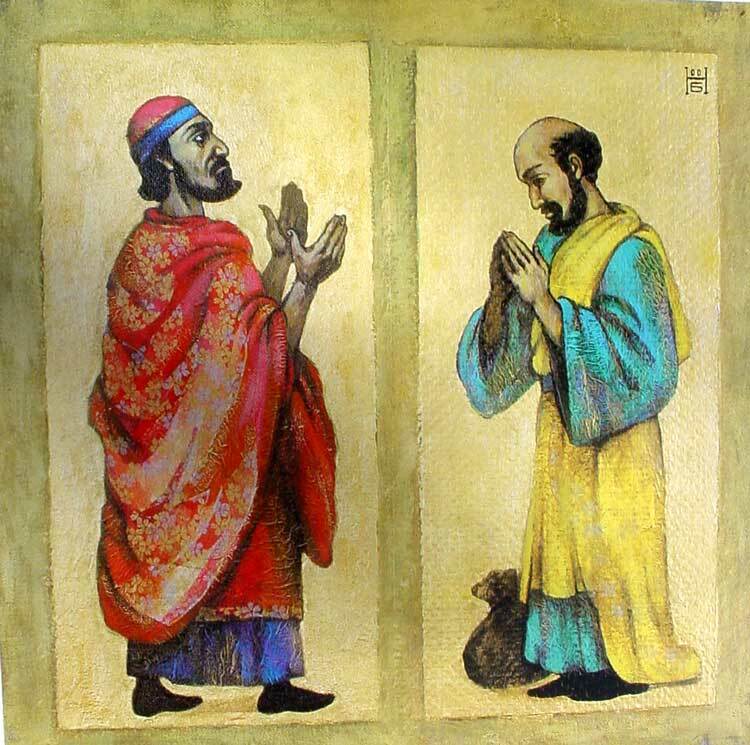 Luke 18:10 "Two men went up to the temple to pray, one a Pharisee and the other a tax collector." "Two men" means "two people." Of course, in this case they were men, but the use of "people" reminds us of the universal truth of either impenitence or repentance among people. In classical Greek the word "other" meant "of a different kind." In Koine Greek this distinction does not always hold. Is it significant here? It hardly needs to be said that a "tax collector" was considered an outcast of society, a collaborator with Rome in taking too much money from the people. Luke 18:11 "The Pharisee stood up and prayed about himself: 'God, I thank you that I am not like other men--robbers, evildoers, adulterers--or even like this tax collector." "God" is vocative. He distinguishes himself from the rest of men. He puts himself into a class by himself. Plummer: He gives thanks not because he is good but because he is the only one who is good; not only because of the good which he has, but also because of the evil which he sees in others. All others are considered "swindlers" and "one who constantly does wrong" or "this publican," used in a derogatory way. Luke 18:12 "I fast twice a week and give a tenth of all I get.'" "Fast" is present tense of customary action. They did this on Monday and Thursday. If ever a man ascribed works of supererogation to himself, this Pharisee surely did. Supererogation means not only doing enough for salvation, but more than enough. In verse 11 he states what he is not and in 12 what he is. This Pharisee is close to asking God to thank him for being such a nice person. Luke 18:13 "But the tax collector stood at a distance. He would not even look up to heaven, but beat his breast and said, 'God, have mercy on me, a sinner.'" A different participle is used of this man. He refused to stand close. His eyes and hands participated in the strong contrast. "Beat" likely denotes repeated action. "God" is vocative. The picture tells us that the publican understood the significance of Old Testament sacrifices. For the use of the verb "be merciful" compare Hebrews 2:17: "For this reason he had to be made like his brothers in every way, in order that he might become a merciful and faithful high priest in service to God, and that he might make atonement for the sins of the people." This verb takes the dative of the person. He calls himself the sinner, not a sinner. Compare Psalm 25:11; 40:12; Daniel 9:8; and 1 Timothy 1:15. David, Daniel, Paul, and the Publican confess that they are, not were, great sinners. Look out for the person who says: "I used to be a great sinner." He still is. Nor should we put a halo around this man's head simply because he recognizes his sins and sinfulness. He is just what he says he is. But, beyond that, the differences are abysmal. Luke 18:14 "I tell you that this man, rather than the other, went home justified before God. For everyone who exalts himself will be humbled, and he who humbles himself will be exalted." "I tell you" indicates Jesus' divine authority. In verse 9 we had the adjective "just" of self-justification. Here we have the perfect passive "justified," justified by God. Both are forensic. The self-righteous man declares himself righteous. God declares the penitent man righteous. In 14b we have the point of comparison ready made. It speaks comparatively of the arrogant, impenitent man, and the humble, penitent man. Christianity is not a quest of man for God ( "I found it") but of God for man ( "He found me"). The most wonderful truths in Scripture are the universal atonement and objective justification in Christ Jesus. See Romans 5:12-21 and 2 Corinthians 5:19. The key words in the New Testament are "be propitious"; "to justify"; "to forgive"; "to love"; "to be merciful"; "to save"; "to reconcile"; "to sanctify"; "to bring to the goal." The latter two are found especially in the Epistle to the Hebrews. Think of 1 John 1:8-10. Faith does not start something. It merely receives what is already so. Repentance is preparatory to receiving what is already there. Impenitence and unbelief render the promises of God in Christ ineffective for the individual. Scripture never glorifies the sin and sinfulness of people but it does glorify repentance, a gracious work of God in the person, for Jesus' sake, whereby one is justified by God through faith, the antithesis to works and merit. The way of salvation under the Old Covenant was the same as under the New Covenant, repentance and faith in the Redeemer. That the Publican knew the Old Covenant is apparent from the usage of the word "have mercy" in verse 13. Look at the usage of this word in the LXX. But the Pharisee, submerged in his self-righteousness, rejects the Old Covenant and therefore is not justified. Adapted from Exegetical Notes, Series C Gospel Texts, Sundays After Pentecost, by Harold H. Buls, Concordia Theological Seminary Press: Ft Wayne IN, 1979, pp. 71-72. Used with permission.